This option is used to create an item with one page or create an item with two pages or more (multi-page). This option is used to create photos of single invoices / receipts so you can manage each item individually in the next step. If you want to review the image, you can tap on the thumbnail on the bottom left of the screen. When you are finished taking pictures, tap Done and you will go to the next screen to indicate whether the document is an Invoice or a Expense. 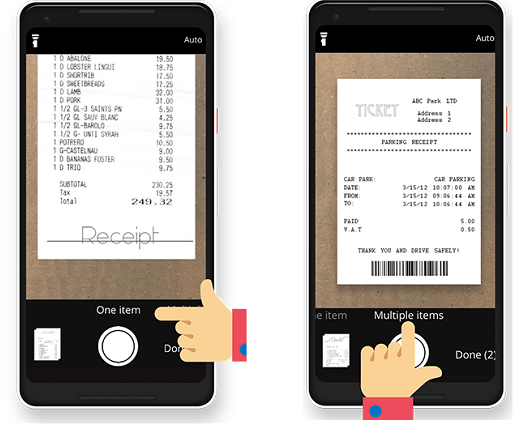 The default option of the camera is Auto where the camera automatically takes a photo when you point the camera to the receipt. To disable the Auto function, tap on this to change the function to Manual on the top right of the screen. This option allows the camera to automatically take a picture if there is a sharp image with a clear background. A message will appear if the position of the camera needs to be changed. The photo will be automatically cropped. This option allows you to manually take the photo. 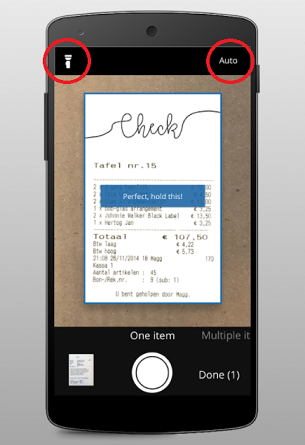 After the photo is taken, you can manually adjust the photo and crop the image if needed. The image can also be rotated if the photo is taken incorrectly (this icon is shown on the top right). When you tap on the flashlight icon at the top left of the screen, the flashlight is enabled and the torch of your mobile is turned on. This will provide extra light to take a good photo. In automatic mode, a tip is given to turn on the flashlight if the background is too dark. The app will not take the picture until the background is clear and bright.